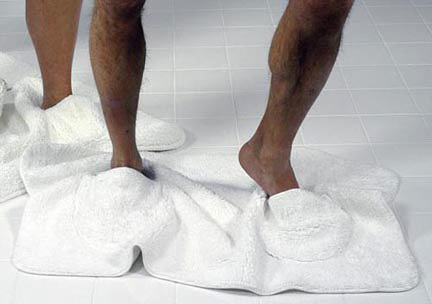 Mat Walk Bathmat Slippers Are Triptastic! | OhGizmo! Mat Walk Bathmat Slippers Are Triptastic! Created by Paolo Ulian, the Mat Walk is supposed to be used after a bath or shower to keep your feet clean and warm, but unless you’re one of the green plastic toy soldiers from the Toy Story films, I can’t imagine you’re going to get very far before you take a one way trip down to bathroom tile land. You can find the Mat Walk at Generate for $49, while bandages and ice packs can be found at your local pharmacy. I find humor in there looking to be 2 guys coming out of the shower. I could say a great many things about this product but all of them would not be constructive. this is such a lawsuit waiting to happen.